Fellowship Previews: Valiant and Arcade Brewery Announce ARCHER & ARMSTRONG AMERICAN PALE ALE – Debuting at C2E2 2016! Valiant and Arcade Brewery Announce ARCHER & ARMSTRONG AMERICAN PALE ALE – Debuting at C2E2 2016! Valiant Entertainment and Chicago's own Arcade Brewery are proud to announce a first-of-its-kind collaboration for Archer & Armstrong American Pale Ale – a refreshing craft APA set to debut this March during C2E2 2016! Just as Valiant's award-winning adventurers prepare to mount a star-studded return with an all-new ongoing series in A&A: THE ADVENTURES OF ARCHER & ARMSTRONG #1 this March, Valiant and Arcade are gearing up to unveil a delectable new libation inspired by comics' premier pair of history-shattering heroes and their upcoming journey into the infinite reaches of Armstrong's bottomless satchel! One's an immortal libertine with a lust for the finer things, the other is a teetotaling ex-assassin with a heart of gold…and now Arcade is perfectly embodying their dysfunctional partnership with a medium-bodied ale like no other! Hopped with Columbus, Chinook, Palisade, Cascade and Mandarina, Archer & Armstrong American Pale Ale builds on a light malt profile to create a complex and wonderful citrus/tangerine character. Clocking in at 7.0% alcohol by volume, Arcade's first Valiant-inspired ale has all the fight of a long night out with Armstrong…but is slightly sweet enough to keep Archer in the game too! Featuring a label emblazoned with the artwork of Valiant-exclusive superstar David Lafuente, Arcade's brand-new APA creation will make its official debut on Saturday, March 19th at the C2E2 2016: Archer & Armstrong American Pale Ale Release Party – from 7 to 11 pm CT at Headquarters Beercade’s River North location (213 W. Institute Pl., Chicago, IL 60610)! Co-sponsored by Valiant Entertainment, Arcade Brewery, Threadless, and non-profit Hope for the Day, the first 200 party-goers will receive a strictly limited A&A: THE ADVENTURES OF ARCHER & ARMSTRONG #1 ARCADE BREWERY VARIANT by artist Jay Fabares and get the chance to have it signed on-site by writer Rafer Roberts! Each attendee will also be entered in a door-prize drawing for a bottomless satchel full of A&A treasures galore, including a complete set of Archer & Armstrong trade paperbacks, a one-of-a-kind sketch cover by A&A’s own Rafer Roberts, official Archer & Armstrong swag, and much more! Portions of the proceeds from the night will be donated to Hope for the Day supporting their suicide prevention outreach and mental health education projects. RSVP online at Facebook or Eventbrite.. 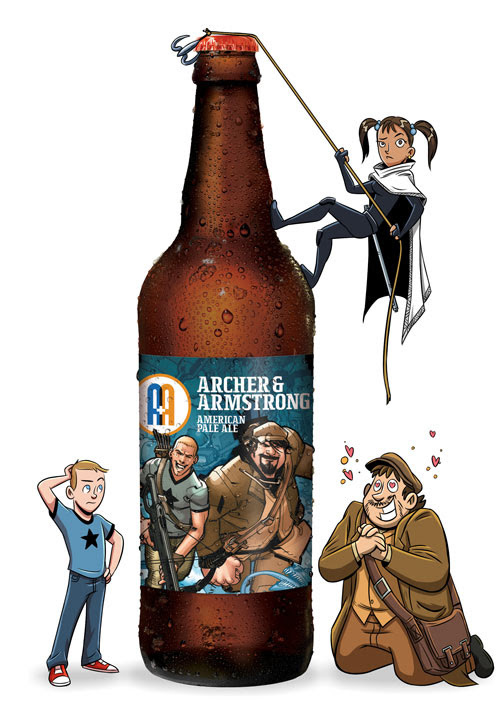 Following in the footsteps of Arcade’s past comics-inspired collaborations with some of the industry’s most popular and well-respected creators, including Jason Aaron, Darwyn Cooke, Tony Moore, Jimmy Palmiotti, and more, Archer & Armstrong American Pale Ale is a limited release and will be available in Chicago area bottle shops. See a map of locations at ArcadeBrewery.com/Beers or buy online at West Lakeview Liquors, The Beer Temple, and Binny’s Beverage Depot. Then, jump into the adventures of Valiant’s (somewhat) dynamic duo with an all-out assault on the senses in A&A: THE ADVENTURES OF ARCHER & ARMSTRONG #1 – the FIRST ISSUE of Valiant’s next flagship series from red-hot rising star Rafer Roberts and superstar artist David Lafuente! The debut story arc – “IN THE BAG” – starts here on March 16th as Archer descends into the infinite depths of his partner’s bottomless satchel to rescue Armstrong from an age-old enemy…and battles his way through an upside-down world of arcane architecture, lost treasures, and strange creatures bent on making our world their own! Find out in A&A: THE ADVENTURES OF ARCHER & ARMSTRONG #1 – on sale March 16th!